Who wants a tablet? Not many people, according from a new report from research firm IDC. Tablet sales have now consistently plummeted for 12 entire quarters over the last three years now, with the latest fiscal quarter seeing only around 40 million units sold compared to the 42.3 million sold at the same time last year. The three big manufacturers, unsurprisingly, are Apple, Samsung and Amazon, and together they account for an impressive 66.7% of the market compared to the 57.2% percent share they had last year. Despite the overall trend of declining tablet sales, Apple and Amazon saw shipments rise year-over-year in the third quarter. Samsung, though, suffered a 7.9% drop, with shipments declining from 6.5 million to 6.0 million. Apple remains at the top, but it's worth noting that only recently has it started seeing shipments bounce back up after a whopping 13 quarters of reduced shipments. All total, Apple's market share bounced up by 3.9 percentage points to 10.3 million units sold in this year's third quarter. 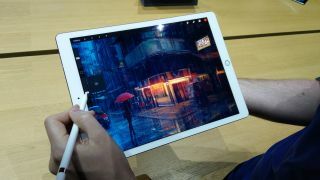 "Although Apple still enjoys a substantial premium over competitors, the lower-priced iPad has helped it to cement the first-place position," IDC says. The firm also points out that the iOS 11 update at last made the iPad Pro more like the PC replacement Apple has long advertised the device as being, but "strong value offerings from other PC and mobile vendors" are keeping it from being more dominant. As IDC notes, part of the reason for the overall declining market is the "lengthening replacement cycle of tablets," as customers tend to buy tablets much in the same way they tend to buy PCs, hanging on to the same device for years even after updated versions come out. There's also an overall shift toward smartphones, and tablets are finding the middle ground between handsets and desktops less appealing than it once was. "There’s a penchant for low-cost slates, and this holds true even for premium vendors like Apple," said IDC analyst Jitesh Ubrani in a prepared statement. "However, many of these low-cost slates are simply long-awaited replacements for consumers, as first-time buyers are becoming harder to find and the overall installed base for these devices declines further in the coming years." Get a cheap iPad deal BEFORE Black Friday 2017!